Transit with wireless is an incredibly attractive way to travel. 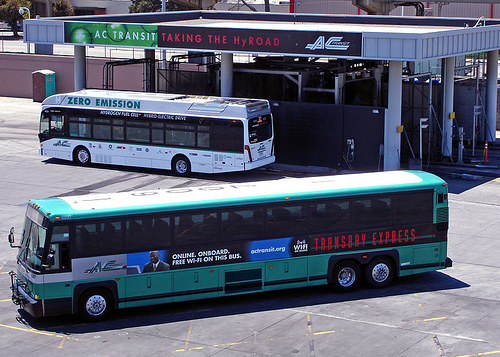 And apparently AC Transit, a regional bus agency in the San Francisco Bay Area, agrees, providing wireless internet on all their buses crossing the San Francisco Bay. Yesterday I had an action packed day of transit; I took BART from North Berkeley to Union City, then hopped on a bus with wireless that crosses the Dumbarton Bridge to Palo Alto, or so I thought. When I realized I was on the wrong bus, and figured out that there were no more buses coming, I had no other option but to take a cab. Fortunately that afternoon I got on the right bus, an AC transit Transbay bus with very fast wireless, and fast service too: it took me just 38 minutes back to Union City! 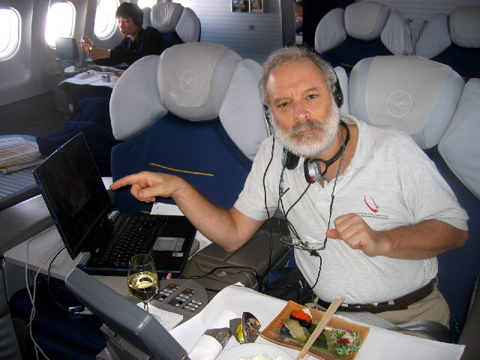 Using my wireless on a Lufthansa flight. I have now used wireless in the air, on a bus, in a car, and on rail. 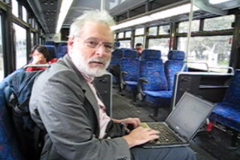 If you’re like me, and you like staying connected, wireless on mass transit is the way to go. It’s also a nice perk for people who might otherwise consider driving in private car to get to their desired destination. Read about my other travel adventures here.